The calendar says it's Spring. By all the rain we're getting today, I would have to agree that Spring is here. Some of you may have noticed that I wasn't in the Shop on Tuesday with Mom. It was just Mom and Grandma. I was grounded on Tuesday. Tuesday morning, instead of getting in the truck, I ran across the road to chase the neighbor's cat. It was soooo funny! The cat is orange and when I chased it, it puffed it's fur out and looked like a giant cheese puff ball running across the yard. What wasn't so funny was when I hear Mom calling me and I could tell by the tone of her voice, she definitely didn't think it was funny. I got a spanking and was told I could have gotten hit by a car running across the road like that. I was also told I was not to be chasing cats, ever. Mom chased me into the house and told me I was grounded and couldn't go to work with her that day. Mom was so mad, I didn't even dare to get up on the counter to eat the cat food while she was gone. And I really love to get the cat food dishes off the counter. I will not be doing that again. Not only because I got into so much trouble but it's really boring staying home. My sisters never behave themselves when left alone, so they have to be crated. So, I didn't even have anyone to play with while I was grounded. I had to sit on the couch by myself all day. That wasn't fun at all. I really love coming into work and seeing all my friends when you come in to see me. Enough of the bad stuff. Onto what's new in the Shop. 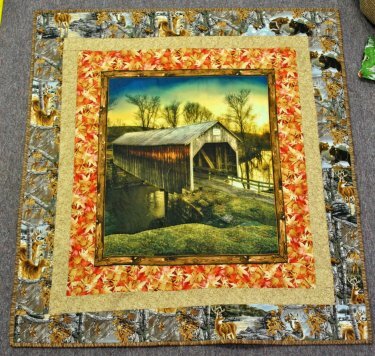 We have a new digital panel with covered bridges on it. They look like photographs. Mom, yes I said Mom, put borders around them to make a couple of samples. One is finished but not the other. Mom said the one covered bridge reminded her of early Spring and the other reminded her of late Fall. 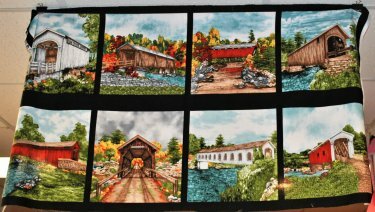 We also got in a dyed covered bridge panel and some coordinating fabrics. There's even a free pattern on Blank Quilting's webpage to make a cool quilt. I might have shown this to you before. I'm not sure. Anyway, it a neat collection. Mom also designed a quilt, yes I said Mom again, Grandma did most of the sewing and Elizabeth quilted it when she was home for Spring Break. It's Northcott's Aspen Ridge Collection. We've had the panels for sometime but when they're hanging by themselves, they look really dark. We made a lap size quilt out of them and the coordinating fabrics and I think it really brings them to a new light. 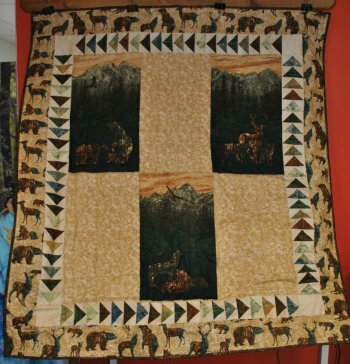 It would make a great quilt for an outdoorsman or outdoorswoman. Don't you think? I almost forgot to show you the Spring fabrics we got in! They are really nice. 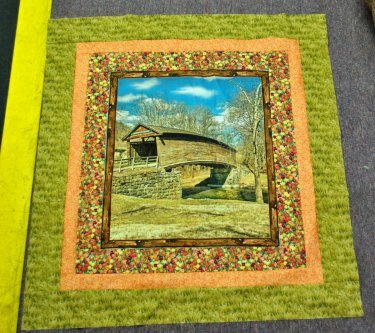 I think they would make beautiful Spring table runners and place mats. You know, you could make a little runner for your coffee table and baby runners for your end tables to bring some cheerful Spring decor into your home. Runners aren't just for dining room tables. 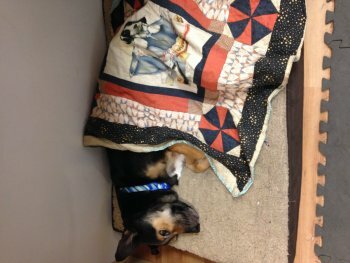 I thing your dog or cat would love to have a quilt of his/her very own. 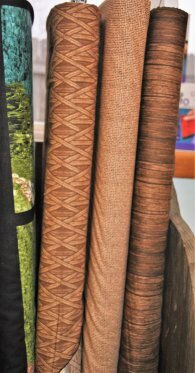 Our clearance fabrics would make great quilts for them. 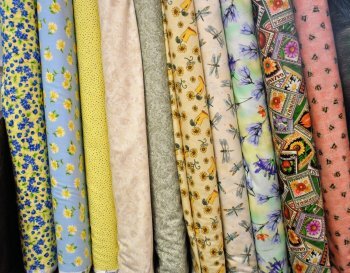 You could use them for quilt backings, too. Mom, yes I said Mom, made this quilt for me to sleep under when I get tired after greeting customers. Grandma helped Mom make my quilt. It's just a panel with batting and backing fabric. I love my quilt. It's warm and cozy. For some reason, it keeps going sideways. But you can see how much I love my quilt. Sometimes, I like to make a nest out of it. We have a couple of dates for you to remember. It starts at 10am. It's usually 45 mins- 1 hour long. You get a free pattern and Grandma demos how to make the first block. If there's a ruler that makes it faster and easier to do the block, she shows you how that works, too. Mom shows you how to maintain your sewing machine in between professional maintenance services. It helps keep your sewing machine in good working order and helps prevent more expensive repairs. 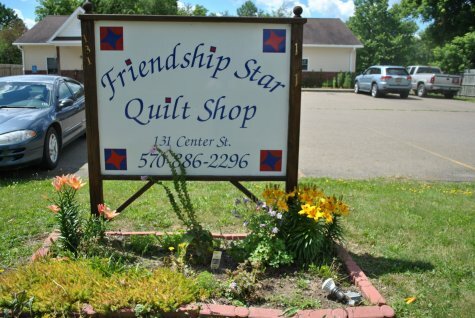 You are encouraged to bring in your sewing machine to learn how to maintain it. The class is 10:30a-12:30pm. It's $10 for the class. We do need 5 days advanced notice that you will be attending this class as seating is limited. We, well not me because dogs aren't allowed, set up at the quilt show. Mom and her assistant, Denise, hope to see you there. I will be staying home, napping and enjoying a long weekend rest. 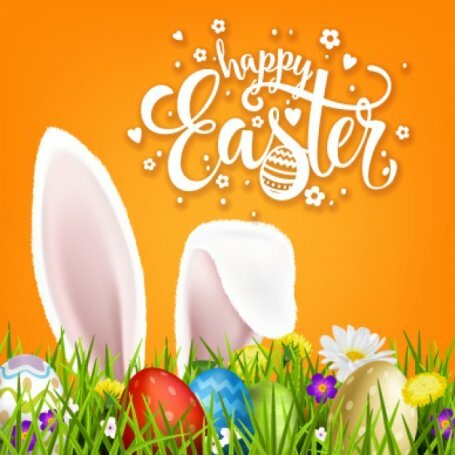 We hope all of you have a Hoppy Easter! What pranks are you going to do to the kids for Easter Sunday?